JULY / AUGUST 2008 -- In May, Sister Peggy Prelli submitted her resignation (we prefer to call it her retirement) from the Connecticut Granger as Subscription Coordinator. From its inception, the Prelli family has been a very important part of this publication. Past State Master Frank Prelli served for many years as the President of the corporation while Sister Peggy served the dual role of Editor and Subscription Coordinator. 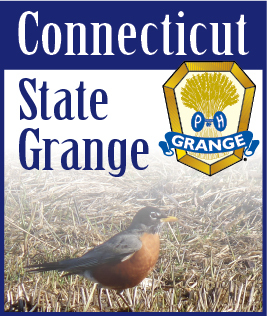 In the age of personal computers, desktop publishing and internet accessibility it is very easy to forget what a daunting task it was to produce the Connecticut Granger in its earliest days. Today, we are able to receive articles via email and “drop” the text directly into the page layout. Back then, all articles were received by mail and were sorted, edited and sent to a publishing company which then typed them into strips the width of a standard column in the Granger. If there were errors in the typesetting, Sister Peggy would then have to cut and paste corrections and then make it all fit into the 12 page layout by literally cutting and pasting the columns onto a layout grid. Then the mailing list had (and still has) to be updated with all of the address changes accumulated during the preceding month. We have used address labels for quite some time but earlier “state of the art” technology called for trays of addressograph cards that were fed into a machine that affixed the mailing address on each newspaper. I’m sure Sister Peggy is chuckling as she reads this and thinks about that process… a process that certainly wasn’t amusing then! She should also be amused to know that her duties will now be divided between the Editor (collecting subscriptions) and the Secretary/Treasurer (handling the subscription accounting). Thank you, Sister Peggy, for all you and Brother Frank have done for the Connecticut Granger through the years.